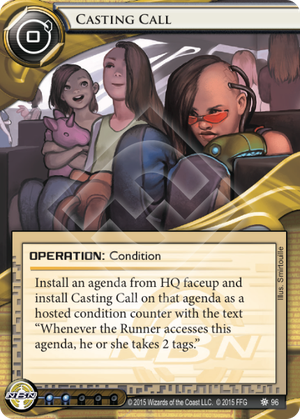 Install an agenda from HQ faceup and install Casting Call on that agenda as a hosted condition counter with text "Whenever the Runner accesses this agenda, he or she takes 2 tags." Moving through the Mumbad Cycle lots of new and interesting uses for Casting Call are now possible and have not yet been explored in the deck design space. Casting Call easily solves the 1st click problem since it is an operation. Another small benefit is that if the runner wants to Clone Chip a Clot or use Artist Colony to install The Source then they will take two tags to steal whichever agenda the corp installed. finally has a fast-advance option. However the downside is that it doesn't work on older face-down Agendas like Project Atlas, High-Risk Investment or Government Takeover. Using casting call to install any Agenda face-up makes Mumbad Construction far more flexible. Does the runner have Film Critic or Imp in their deck? If not just naked install a Quantum Predictive Model. Since the corp chooses the order in which corp simultaneous effects resolve, the two tags on access can resolve first causing QPM to be added to the corp's score! Under normal circumstances there is no rush to score QPM either, it can be left on the table until the Apocalypse comes. 0 to play, Shipment from SanSan is also 0 too, with Jeeves you can FA a 3/2 Agenda for only 1. Casting call is interesting because it allows the Corp to use one of their agendas to openly taunt the runner. Although two tags wont completely deter most runners, Combining Casting call is probably best applied to already taxing agendas. Agendas like Fetal AI, NAPD Contract, TGTBT,Explode-a-palooza or Award Bait, can become extremely devestating. The runner is forced to choose between letting the corp score or take a painful, and possibly game ending, tempo hit. The second place I expect Casting Call to get played is in Wayland decks. There is obvious synergy between Casting Call and the new 'install faceup' agendas ( Underway Renovation , Oaktown Renovation , Hollywood Renovation). Since these agendas need to be installed face up anyways, and Wayland excels at punishing the runner once tagged (Dedicated Response Team, Scorched Earth), there's very little reason not to splash a Casting Call or two. Casting Call is nuts. A 2-influence operation that states "give me this agenda, oh and it costs 2 clicks and 4 credits to steal." In faction, it finds a nice 1-of / 2-of home in Butchershop variants with Scorched Earth and Traffic Accident. It can also see play with the new variety of tagging options in D&D. In Weyland, Casting Call is a beacon of shining hope that descended from the heavens and touched little Weyland's cheek and said don't worry, it's not over yet. A turn 2 Weyland play that will cause a lot of Wow's and amygdala reactions is ice remote, Casting Call Project Atlas, advance. It's turn two, your Shaper rump still hasn't played their first Clone Chip and this guy is saying "Screw your SMC crap, if you can't get in by click 2 and spend 4c dumping the tags this is my Atlas counter." The card retains value throughout the game, severely punishing players who like to hold punches in their grip to deal with your super Archer/Curtain Wall/Tollbooth remotes. You can suddenly swing a score in your favor by forcing them to get in by click 2 or keep a tag. It's not even a double, so you can plop Casting Call onto your favorite 3-pointer and push for gold! Rating: Crazy/10. Revives Weyland 'Supermodernism' aka Scorched Rush and gives Blue Sun even more bite. Instantly replaces any loose Snare! or Ash 2X3ZB9CY.